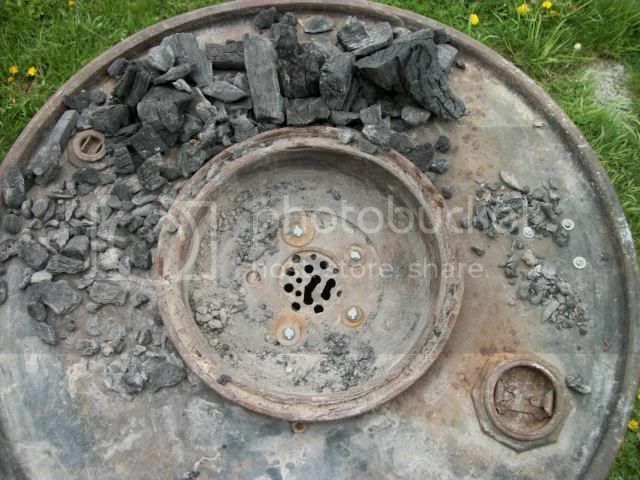 My coal forge is a break drum design. Metal 2x4 stud for the frame and 1/8th inch floor plate for the hearth. I use a Bucket Head small shop vac for my air blast with an inexpensive dimmer switch for blast control. It works very very well. And now that the weather has warmed up a little bit, I actually get to use it. I need color suggestions for the stucco. I am thinking terracotta over the gray and blue over the red brick? Perhaps some mosaic work over the hearth? The innards are 4" block and the table is poured aggregate, with poured aggregate/fireclay/fire brick around the fire pot. It is a round heavy duty one that is set 1/2 inch below the edges of the table. I have a smaller free standing forge that is probably a Champion. (came with a Champion blower) I don't have pictures on here right off though. 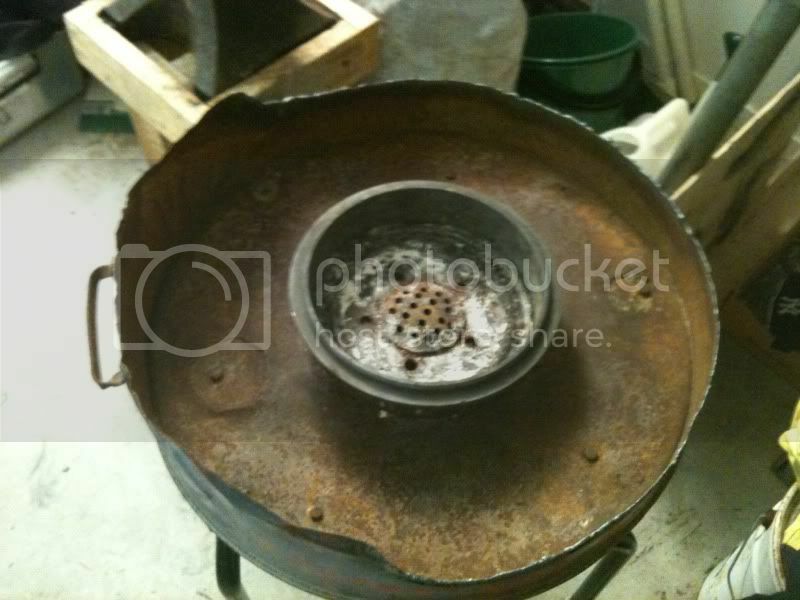 It has a 1/2 plate fire pot also 8"x10" but I built it too deep. (7 inches) I raised it with fire brick and mud but that has burned out. I need to cut a piece of 1/4" plate and weld it higher up. I like a 4 inch deep fire pot. 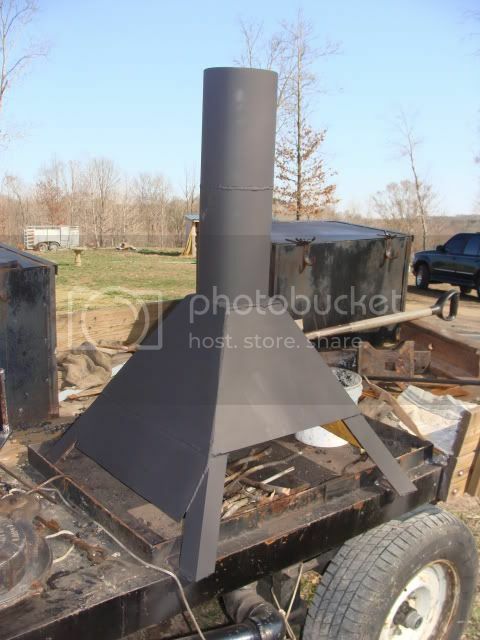 I am wanting to sell the demo forge this summer and redesign/rebuild. The forge will be smaller to make more room. No need to have it that large if it is ONLY used for small demo items. I'm designing a 4'x4' forge for my shop. It will be 1/4 plate with 2 inch sides. The fire pot will be a full 12"x12"x4" out of 1/2" plate. I am designing a sliding rack that will be welded under the forge, to slide out to hold longer pieces of steel it will have adjustments outward at least 4' if not closer to 8' and it will also adjust up and down to get the proper angle on the steel. I'll be using a side draft hood. Pictures of all that later though! P.S. this picture was taken during some renovations on the trailer so please pardon the mess.....including anvil on it's side, bucket, paper, sticks, and dismounted blower. This is the typical forge that I build. I use angle iron for the frame and a steel plate for the bottom, just that simple. I ordered the fire pot from Centaur Forge. I built this one in about 3 hours. If you have a welder, cut off saw, and a torch, your in business! I like to use the fire brick just to keep the coal hugged up around the pot, this is not necessary though, it's a personal choice. I just got this one put together today. My last one was just a fancy hole in the ground I like this one much better. Thanks Dodge. 14 years in July and still going. The forge is just a break drum with a lid from a 55gal drum as the table top. 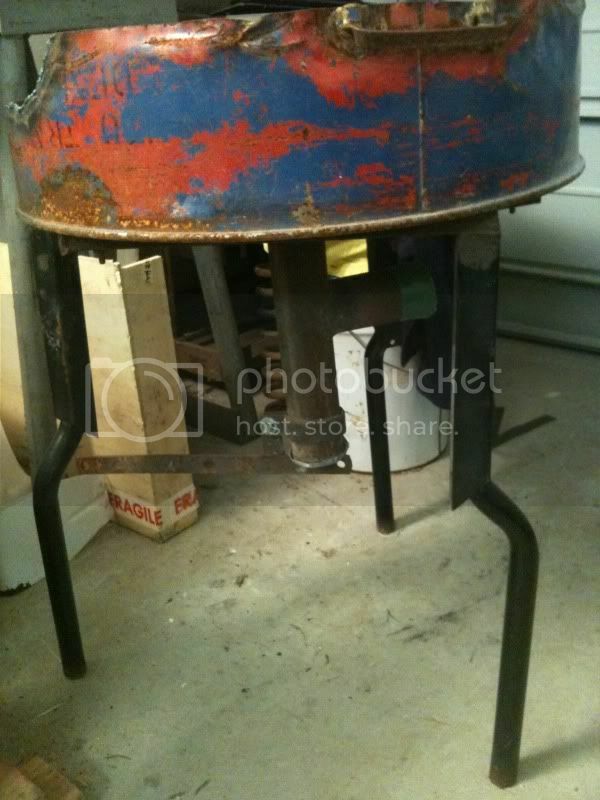 If you look in my blog My blog you can check out my old forge this one agrees with my back much better. WOW, Jeremy! I just looked at your blog. I see so many folks struggling with making a forge with many more resources than you started with. You truly have personified the concept of "improvise, adapt, and overcome". BTW, Thank you for your continued service. Semper Fi! Here it is, 1 week and $20 later. I only had a sledge and channel locks. I can already see alot of room for improvements. 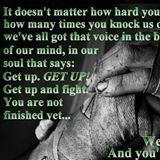 YOU ARE DOING! Nice job. Find a stump (log) and you can stand up. I admire creative men and women such as your self. When someone can make it work with very minimal tools such as you have done, I feel even the sky is no limit for you. Given some time, and if your interest has not been fulfilled, I will bet that in a short time you will do very well at this craft. Please keep up the good example of “Getting it done” with only the basics. Your example should be something that new blacksmiths should be able to look at, and then go for it themselves! Have a good and safe journey down the blacksmith trail! That is a cool set up. Beats digging a hole in the ground like I did for my first forge. P.S. nothing wrong with channel locks. That is what I have been using. I got this for free from an old man that I don't even know, true I had to fix the ring in there and it is cracked, but hay it was free. 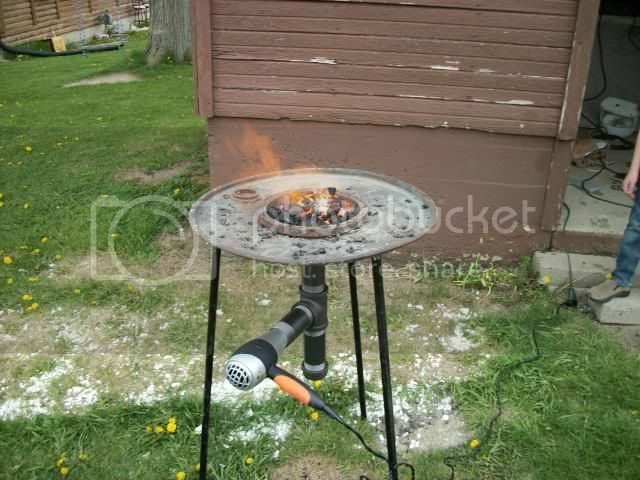 It was originally a smoker, which was converted to a gas grill, which was converted to a forge. I like that I can lower the lid, because it helps with smoke management when I'm starting the fire. What I don't like is that it's a bit too enclosed; makes it hard sometimes to position the workpiece. Please excuse the fuzzy photos. Here's mine, based on the 55 Forge blueprint. I'd like to first mention that I owe Double_Edge2 big thanks for all his assistance with the build. I suspect JReed's is closer to what was intended, but currently the gap around the brake drum acts as a fuel bin - just got to make a coke shovel that's a better fit in there. I found the 55 top already cut to the upper edge (the nice clean one) & decided to just go with what was there. I flame cut the lower edge to about the same height as the top of the fire pot so that irons could rest horizontally in the fire instead of finding their way into the molten clinker. The upper legs are bolted to the base, and come off an extract fan that I had to replace at work. The fan (not shown) is a 12V car ventilation fan, so it's pretty quiet. The duct tape you can see in the photos seals the fan reducer cone to the tuyer pipe. I still need to obtain a permanent 230V AC to 12V DC power supply of some description. 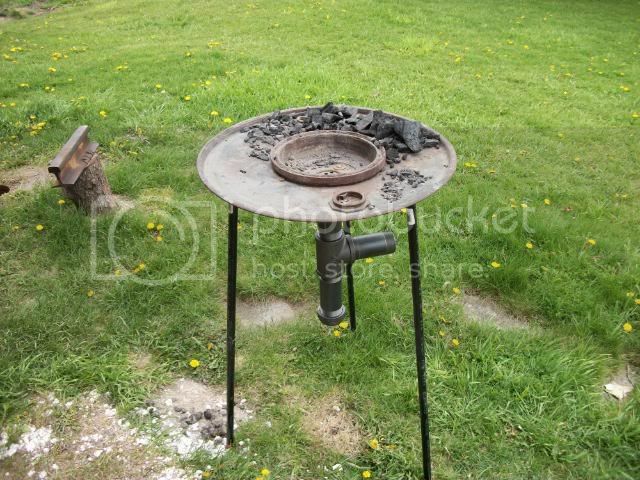 The pipe is welded to the brake drum fire pot, which in turn simply rests on the base of the hearth body. The lower legs are not fixed either. This way it all comes apart for transport in a car & is easy to clean off beforehand. If I ever get a trailer or a ute I probably wouldn't bother dismantling it. 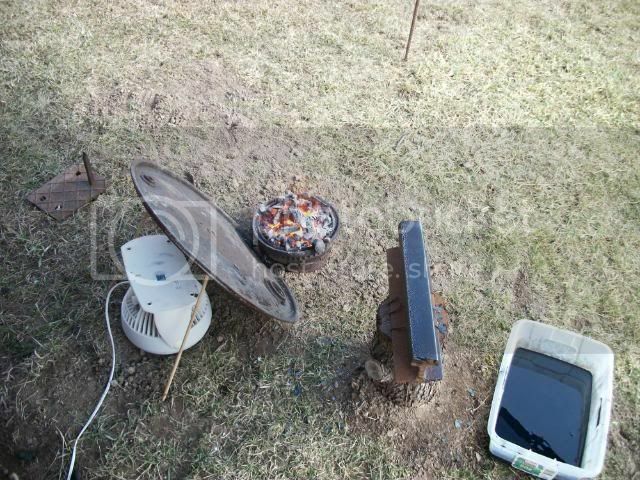 The tuyer pipe was left long so as to enable extended use with charcoal before ash must be dumped. However I have to admit I probably overdid that. Although it looks spindly & certainly not a nice professional job, it has proved to be pretty sturdy & stable so far. One idea for improvement I'm toying with is a tool rack. Another is to cut it almost right down similar to JReed's, except for the back & a small lip all round, and inletting (sp?) the fire pot so that the whole thing ends up a bit more like an old portable or rivet forge. However I want to retain the idea of having coke on the table ready to be pulled into the fire. Comments on those ideas or any others for improvement are most welcome - this is most definitely a work in progress! O.K., I'll play! This is my first. I have learned: didn't really need to use a semi wheel. Haven't figured out how to cut slots in the sides for longer pieces. Note my fancy customized HF stand. Hey, works for me! Easy way, 4 1/2 inch (or larger) grinder with some cutoff disks. I like it. The reason I went with just the lid is it is all I had. I wish I had as much of the drum as you do. Inletted like mine is I have plenty of table space to lay up fuel to be raked in with out the use of a shovel. I made my ash dump long also and I can run for hours with charcoal with out having to empty it. If you make changes post them I would love to see them. I lined my fire pot today. I switched from charcoal to coal now that I have a source of supply. With the new fuel I found that I needed to make the inside shape more efficient. After reading all the info here I dug up some clay from the yard and lined it to make a bowl shape. When it dries after a couple days I will snap some pic's.